Many health experts are adamantly against eating potatoes. French fries, potato chips, baked potatoes soaked in butter and sour cream, and potato skins covered in cheese, bacon, and ranch dressing are all on the list of foods not to eat. Many experts blame these processed potato dishes for our country’s high rates of obesity, heart disease and diabetes. But the potato is a good food gone bad — a fallen SuperFood. Understanding the potato can help us understand how to eat and how not to eat one. The Russet potato is what we know as the Idaho potato. It has brown skin, a white pulp and it’s commonly used for baking, boiling, mashing, and cutting up into French fries. Believe it or not, a baked Russet potato with the skin is low in sodium, high in potassium (more than a banana), is a good source of fiber, has no fat and no cholesterol. One baked, medium-size Russet potato (6.5 ounces raw, about 5 ounces after baking) only has 135 calories and has 3 to 4 grams of protein and 3 to 4 grams of dietary fiber. The potato is also a good source of vitamin C, vitamin B6, folic acid (folate), beta carotene and iron. In 2004, the USDA ranked the Russet potato number 17 on a list of the top 20 sources of antioxidants–above plums, black beans, and Gala apples. Spinach didn’t even make their list. And finally, the Russet potato is relatively inexpensive, so you can get tons of nutritional power for your dollar. In 2004, the Journal of Food Composition and Analysis published a USDA study that developed a comparison database for the antioxidant content of fruits and vegetables. The study published ORAC (Oxygen Radical Absorbance Capacity) and TAC (Total Antioxidant Activity) values for 11 fruits, 8 vegetables, 5 nuts, 3 dried fruits and rice bran. ORAC and TAC are methods for studying the antioxidant activity of food by challenging the food, in a lab, to free radicals and measuring how well they remove the free radicals. The common Russet potato had a Total Antioxidant Capacity of 13.2 (blueberries had 62.2). The interesting result is that it ranked higher than carrots, kiwis, watermelons, cantaloupes, radishes, and even tomatoes. Granted, the potatoes were baked to retain their vitamin C activity, and tomatoes were boiled, which lowers their vitamin C content. Why Potatos Have a Bad Rap? As of late, high carbohydrate foods have been tarred, feathered and ridden out of town on a rail. The potato has been grouped in with white rice, white bread, and pasta for being high in carbohydrate and low in nutrition. The fiber and the nutrients in the potato alone should differentiate it from the other “high carb” foods. It is true that the potato has a high glycemic index, which means it rapidly increases blood sugar (glucose) after ingestion. But, remember that glucose is the main energy source for the brain, and we need some carbohydrate for energy. The real problem with the potato is that it is a vegetable asking to be processed. 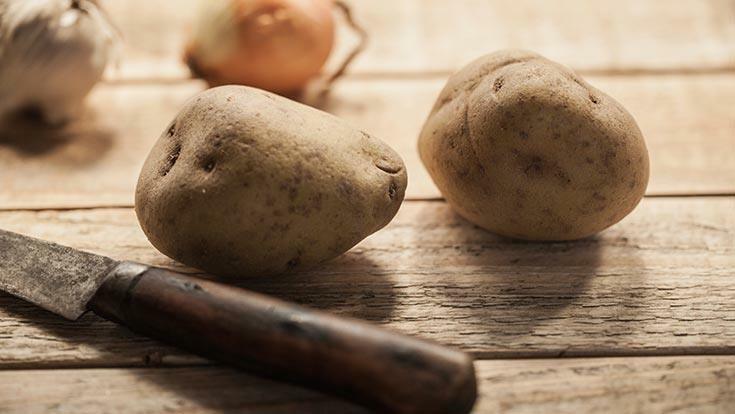 One medium, baked Russet potato as part of a balanced meal can be considered nutritious: no fat, no cholesterol, a good source of dietary fiber, packed with antioxidants and only 135 calories. But peel it or skip out on the skin and you lose out on the fiber. Fry it and the potato will soak up the frying oil, turning a no-fat food into a high-fat food. By adding 2 tablespoons of butter, you add 200 calories and 22 grams of fat. Three tablespoons of sour cream adds 90 more calories and 9 grams of fat. Adding bacon and cheese adds over 300 calories and 15 grams of fat. The other problem is serving size. We tend to order a huge baked potato to hold even more butter and sour cream, or a large order of French fries. When that happens there’s little goodness going into your body. Baked potatoes can be enjoyed with other SuperFoods like plain yogurt, steamed vegetables or tomato salsa. Just be sure you eat the skin, too. If the potato is too bland, try flavoring it with vinegar or spices. Avoid salt, butter or regular sour cream. Store your potatoes in a dark, cool place. Keep them in brown paper bags, not plastic bags. Don’t keep them in the fridge because the cold temperatures will break down the starches into sugar. Separate the potatoes from the onions, because the onion fumes will rot the potato faster. When baking a potato, don’t wrap the potato in foil. Wrapping the potato in foil tends to steam and not bake the potato. This leaves the skin soggy. Simply wash them and put them on a baking tray. Don’t eat the potato if it has turned green or started to sprout. Potato plants create a glycoalkaloid, called solanine, that acts as a toxin which causes stomach pain and diarrhea. Cooking doesn’t tend to remove the toxin.